Products : Chicago Blowers : Direct Drive Airfoil Plug Fan - Draft Air, Ahmedabad, Gujarat, India. Direct drive simplicity converts to lower initial cost and less operating expense, as there are no fan shafts, bearings, belts or guards to maintain. Plug fans utilize Chicago's quiet, efficient airfoil wheel with hyperbolic inlet cone. Exceptional rigidity is afforded by the heavy steel panel with flanged edges and gusseted motor base. 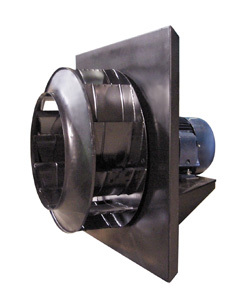 Plug fans are designed for horizontal or vertical installation. Chicago's direct drive airfoil plug fan offers a compact economical alternative to belt drive plug fans. Applications include packaged equipment for cooling, drying, dust collection, recirculation and aeration systems. For retrofit installations, the compact direct drive configuration allows greater system flexibility. When coupled with a variable frequency drive, performance is no longer limited to synchronous motor speeds. Fan Sizes 12-1/4" to 30"